Dr. Melodie Billiot is known nationwide as a expert and sought-after teacher of nutritional and energetic techniques. She is the founder of Alternative Health Atlanta and the developer of the EVECTICSSM health therapy systems. 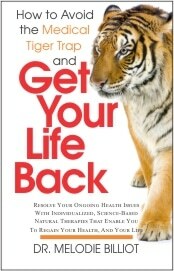 How can you finally put your health problems behind you and live your life more fully? Enter your contact information in the form to your right and you’ll be able to download this book for FREE. Remember that we’ll never sell your email address to anybody, and that’s a promise!